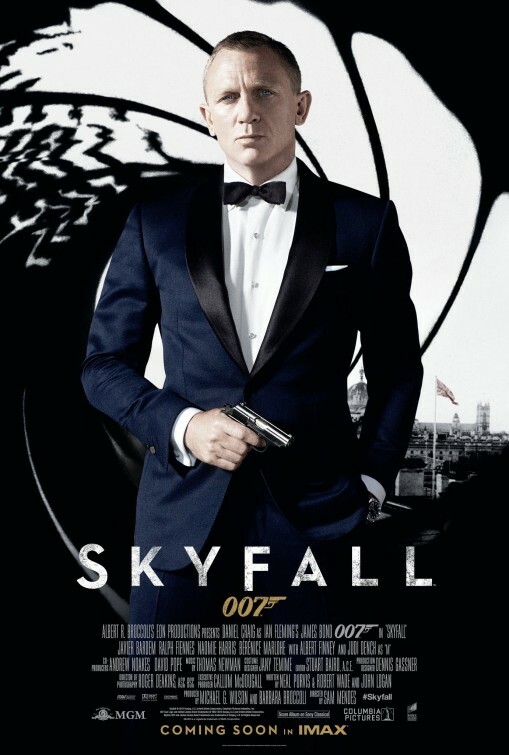 British director Sam Mendes follows up his 2012 blockbuster Skyfall, with the 24th installment of the 007 franchise aptly named Spectre, which serves as a pastiche of all previous Bond films, but particularly referencing Casino Royale, Quantum of Solace and Skyfall. With a truly spectacular opening sequence shot during the Day of the Dead festival in the sprawling and crowded central plaza of Mexico City, Spectre promises better and bigger cinematic moments. On all accounts, Spectre delivers although at times, the Bond film could have been more tightly edited. The action sequences in Mexico City, Rome and Tangier are gripping and the production design and cinematography are quite startling, shading the film between sequences of extreme illumination and murky darkness in keeping with the sinister undertone pervading the entire narrative. Mexico City and Tangier are beautifully done, with gorgeous colours contrasting against the monochromatic elegance of the Roman streets at midnight or the snow covered Austrian Alps during ski season. The Tangier scenes are clearly influenced by Bernardo Bertolucci’s classic film, The Sheltering Sky, especially when Bond and Dr Swann disembark from the Moroccan train into a sweltering Saharan desert, while the previous action on board mirrors that of The Spy Who Loves Me. Audiences should watch out for Dave Bautista (Guardians of the Galaxy) as the Spectre henchman Mr Hinx who has a penchant for popping a man’s eyes out with his thumb nails. 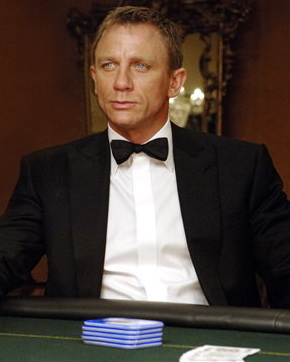 Daniel Craig returns as James Bond looking slightly weary and a tad less nimble but nevertheless maintaining a smirk on his face along with those dazzling blue eyes. In a stroke of genius casting, French actress Lea Seydoux is brilliant as Dr Madeleine Swann, daughter of the Pale King, whilst the villain is suitably menacing and at times slightly camp, Franz Oberholzer better known as the evil mastermind with a penchant for white Persian cats, last seen in You Only Live Twice, On Her Majesty’s Secret Service and Diamonds are Forever. Naturally, Oscar winner Christoph Waltz (Inglourious Basterds, Django Unchained) is fabulous as Bond’s crazed arch enemy, but somehow does not make as brilliant an impression as Javier Bardem did as Raoul Silva in Skyfall. 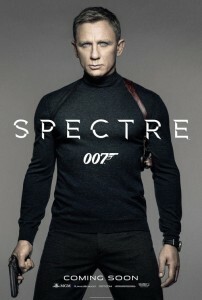 With the absence of Judi Dench as M, Ralph Fiennes, appears craggy and irritable as the new M, reminiscent of the original M in the 1960’s Bond films. Refreshingly, Naomie Harris as Moneypenny and Ben Whishaw as the technically gifted Q have bigger roles in Spectre, acting always as Bond’s necessary sidekicks. Watch out for a brief but glamourous cameo by Monica Bellucci as Lucia Sciarra and Jesper Christensen as the ubiquitous Mr White, last seen in Quantum of Solace. Spectre, which stands for the Special Executive for Counter-intelligence, Terrorism, Revenge and Extortion is subtly portrayed as a pervasive and dangerous shadow organisation responsible for all sorts of international atrocities, which in the 21st century is particularly apt. As the visual references abound throughout Mendes’s Spectre, it will only be the serious Bond fans that will spot all those cinematic clues. In this respect, Spectre pays tribute to the success of the longest running film franchise ever, without undermining its inherent and enduring appeal. 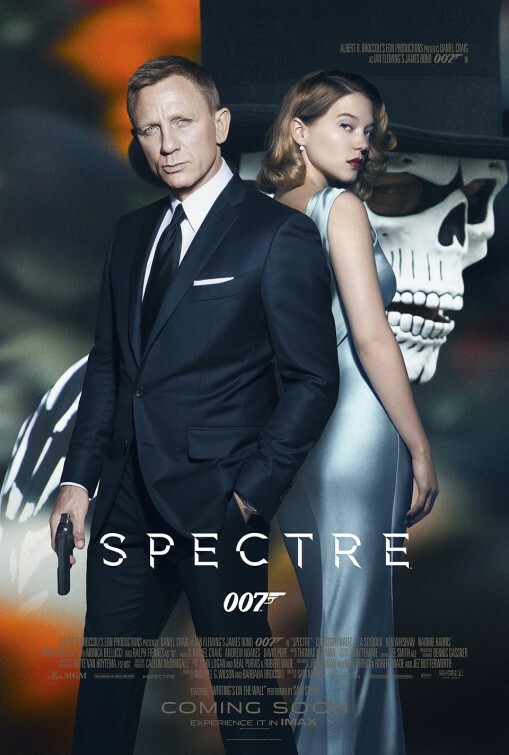 Spectre is highly recommended viewing for ardent Bond fans, although some might find this film slightly long and the narrative muddled, but then again, one has to identify all the past 007 signifiers, for Spectre to be truly appreciated. The question remains, much like the creepy opening sequence, is there life after Spectre? Ian Fleming’s short story of the Quantum of Solace is a far cry from its cinematic reinvention with only the thematic strain of revenge being retained. In the novella, James Bond hears a story whilst dining at the Governors mansion in the Bahamas of a man who marries an air hostess on a flight from Lagos, Nigeria to London and takes his new bride to Nassau where he is posted as a colonial official of the Caribbean island. Remember the story was written in the 1950’s when Britain’s colonial influence stretched far and wide. In the Bahamas the colonial civil servants new wife proceeds to have an affair with the wealthy local golf pro at the Country Club and when the seemingly mild husband finds out about his wife’s indiscretion, he takes revenge not only on his wife but also on her lover. 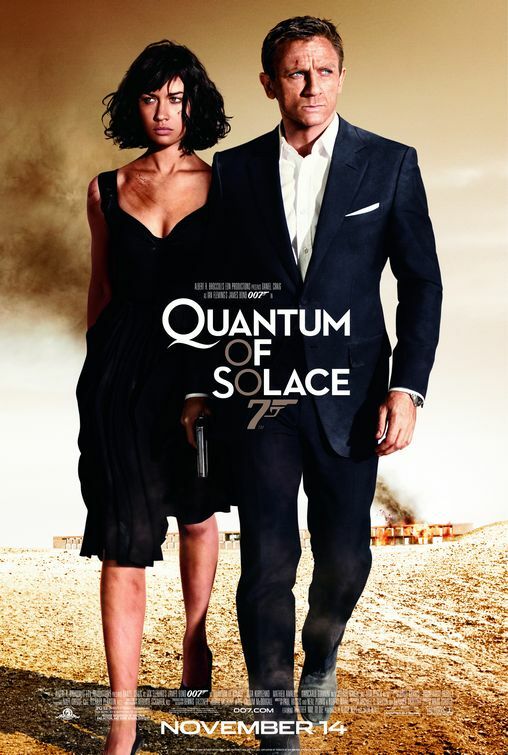 The strange term of a quantum of solace is as Fleming explains it when a man single handedly takes revenge for something or someone that has wronged him. So naturally whilst an idle gossip at a lavish dinner party would not really make an engaging Bond film, the theme of revenge certainly would. A 21st century Bond, the recognizable character of the most successful film franchise ever, who in every film has to reflect not only the decade but the popular tastes of a new generation of film goers? Quantum of Solace opens spectacularly with an intensive car chase, Italy and then after the retro opening credits (not designed this time by Maurice Binder), continues with a high-octane fight sequence in a Cathedral in Sienna culminating in a discovery that there was a breach in security in Mi6. Further technological investigation tracks down that the informant who Bond quite intently dispatches in Italy was working for the mysterious Quantum organization and was receiving funds from a front man in Haiti. As in all Bond films, James tracks the spy trial to another exotic location to find out who his real enemy is. In a warehouse in Port-au-Prince, a Bolivian girl Camille played with a lethal panache by Ukrainian actress Olga Kurylenko, who if anyone managed to catch the film version of the PC game Hit man, would know that Olga is not shy when it comes to taking on gritty action roles. Camille is on her own personal quest for revenge and Bond soon meets the mild but manical villain Dominic Greene, a French-born environmentalist who has sinister plans for Bolivia. As with all Bond films, he follows the villain to a spectacular meeting in Berlenz, Austria, while during a stunningly contemporary production of Puccini’s Tosca, Greene reveals his sinister plans for Bolivia and South America as a whole. Interestingly it is the evil plans of every Bond villain that has always accurately reflected the time in which the films are made. If it was Moonraker, (1979) it was Drax’s conquest of space. If it was The World is Not Enough (1999)’s it was Renard’s control of the world’s supply of oil from Azerbaijan. In 2008, in a world very concerned about climate change and ecological transformation, in Quantum of Solace, it is Dominic Greene’s desire to control a continent’s water supply, that precious resource that like oil is also slowly dwindling away. With Marc Foster, director of such captivating films as Finding Neverland, Monsters Ball and The Kite Runner, at the helm of Quantum, he brings a certain distinct aesthetic to the 22nd James Bond, Quantum of Solace, while retaining the dark undertones of blind revenge at all costs as much as solving the mystery of Vesper Lind’s death in Casino Royale. 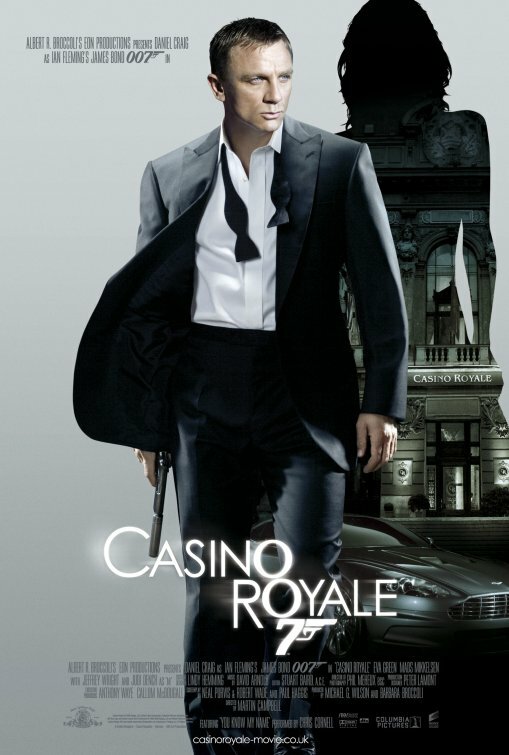 Quantum is a direct continuation of Casino Royale; the first time this sequential dedication has been used in the Bond franchise, so clearly those viewers who followed Casino Royale closely will enjoy Quantum of Solace. A note of warning, this Bond film is more in the style of the Jason Bourne Trilogy and a far cry from those cavalier Bonds films of the Roger Moore era with his effortlessly wit and charm. Here Daniel Craig portrays a man set on revenge, taking no prisoners and not inclined to follow orders, while displaying a physicality and brutality quite brazen and skillfully managing to reinvent one of the longest running and suave filmic characters ever created. Ian Fleming would be proud were he alive today. In Quantum of Solace, the producers were truly appealing to a new 21st century generation of viewers making Bond much more physical, less charming and equally deadly. That was always the key to the success of all 22 Bond films was their ability to reinvent the formula to reflect the tastes of the cinema going audience of whichever decade was current. Obviously the stable ingredients of nasty villains, gorgeous Bond girls, exotic locations and loads of amazing action sequences were always part of that lucratively and wildly successful Bond franchise. See Quantum for the car-chase sequence in Sienna, the Austrian opera scene and of course the final showdown at the gorgeous Dunes of Sands Hotel in central Bolivia, which is actually shot in the Atacama Desert in northern Chile.